Die-hard loyalists of Lok Satta Party are still coming to terms with the decision of its national party president Jayaprakash Narayan to consider strategic alliances and tactical adjustments with other parties, particularly the BJP. But then, they are also aware that the bureaucrat-turned-politician will not take such a radical decision unless he has thought it through and convinced that it could be the faster route to achieve the party’s agenda -- of good governance, citizen’s empowerment, healthcare and employment without compromising on party’s core values. Dr. Narayan tries to clear the misgivings in a free-wheeling interview to The Hindu. Why this decision to consider alliance with traditional parties when Lok Satta’s objective is to transform politics ? Lok Satta never ever said politics or all politicians are bad. There is no single villain in the present political system. Not only Lok Satta, if any ethical party says it won’t work with anyone until people repose full faith in it, then you have made yourself irrelevant. While public esteem for Lok Satta is high in the State, the perception that it might not be in a winning position has resulted in a huge gulf between our support base and votes. Once electoral success is assured, many capable leaders will be ready and willing to take the responsibility of playing a catalytic role for change at the constituency level. What is the basis for considering an alliance with other political parties? Given the plurality of India and compulsions of electoral system, Lok Satta believes if reasonable standards are met in terms of political behaviour, we should work with other parties to further a common agenda - democratic reforms, public participation in politics, improvements in quality of life and governance. Why did Lok Satta prefer an alliance with BJP ? Our first choice was Aam Admi Party but being wedded to a monopolistic regime, it spurned our suggestion. Then Lok Satta had to make a choice between the Congress and the BJP based on four yardsticks -- pursuit of dynasty politics, dependence on money power, belief in freebie culture and promotion of sectarianism. Congress flunks miserably on all measures but the BJP passes the muster on the first and third measures and to a lesser degree on the second. Divisive and vote bank-based politics exploit caste, region, religion and language. We should recognise that caste and region are as pernicious as religion in dividing people. How will you deal with it if this alliance undermines Lok Satta’s credibility? Any alliance will be on our terms. We will not act desperate but we do reserve the right to negotiate. If an alliance partner advocates communal and hate politics, we will walk away and won’t look back. What difference will this alliance make to the State? Lok Satta unveiled a clear-cut agenda with focus on eradication of corruption, per capita grants to villages and wards in towns, provision of quality education, health care, remunerative price to farmers, 24-hour power supply. Our strengths are we articulate our goals well and pursue them in a systematic and steadfast manner. 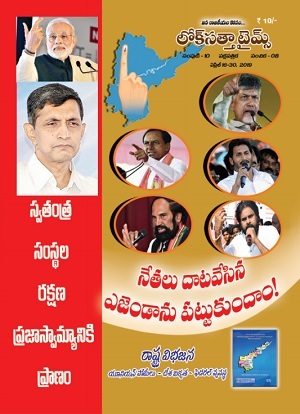 Is an alliance on cards with Telugu Desam? We will enter into alliances with local parties which are prepared to abide by our agenda. It is not possible to align with parties steeped in corruption and those responsible for the crisis in the State. WORST DECISION EVER... REST IN PEACE JP... Thank you for this splendid BETRAYAL!! A wise decision!!! This will ensure in more votes for Lok Satta which means more saner voices in the Assembly and the Parliament.Every small entity needs help and support of a larger entity to be able to grow and stabilize. Once we have the numbers, we will be able to do more for the people and then we wouldn't require the support of other parties. It is easier to complain, just put yourself in JP's shoes and you will understand his actions. We understood that alliances will give more space and chance to achieve our goals, still BJP and TDP are very far from what we dream. 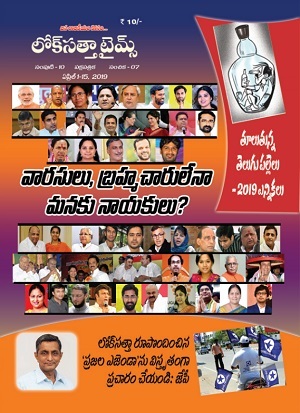 At center BJP may seem a better option but with in our state TDP and its agenda with whole package of freebies is far from our ideals and I couldn't figure out good out of TDP loksatta alliance .